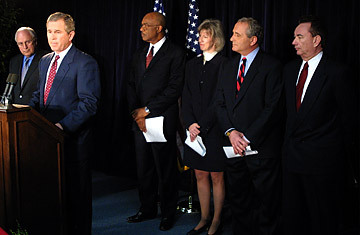 President-elect George W. Bush announces Cabinet nominees during a press conference in Washington, DC in December, 2000.
Who Will Obama Pick as Treasury Secretary? On Nov. 4, at the end of one of the longest, most grueling campaigns in modern political history, Barack Obama became the 44th President-elect of the United States, and its first African-American commander in chief. He had mobilized a staff of organizers and volunteers that numbered in the millions, and amassed a war chest of some $700 million. Now, however, the tough work begins. Between today and his inauguration on Jan. 20, 2009, Obama must pick his advisers, organize a staff, appoint his cabinet and learn how to operate the countless levers of control that come with the highest office in the land  everything from getting briefed by U.S. intelligence agencies' top spymasters to figuring out the White House phones. Despite a promise from the incumbent, President George W. Bush, that Obama could "count on complete cooperation from my Administration as he makes the transition to the White House," the next ten weeks mark a challenge that has frustrated many a President. John F. Kennedy, for example, didn't even have his predecessor's encouragement: when he took over the reins from Republican Dwight D. Eisenhower failed to take action on several issues toward the end of his presidency that would have made Kennedy's transition easier. Eisenhower's final term and subsequent exit from office have left a legacy that recalls him as one of the more indecisive presidents in history. Both Obama and John McCain started early; like their predecessors, they made sure their transition staffs (and, in Obama's case, a corresponding website) were up and running well before Nov. 5. Obama has already received an acceptance from Democratic Representative Rahm Emanuel of Illinois to be his chief of staff. Bill Clinton spent a month pondering his decision in 1992, finally settling on his lifelong friend, genial gas company executive Thomas F. McLarty III, a choice that bewildered many Clinton associates who doubted McLarty had the tenacity for the job. Two years into his first term, McLarty was forced out, becoming instead a "counselor" to the President; Clinton replaced him with Rep. Leon Panetta of California. Obama's far from the fastest off the mark, however; in 1976, Jimmy Carter created a transition staff shortly after winning the Pennsylvania primary  well before the Democratic National Convention in July. Under Jack Watson, who had worked on Carter's successful Georgia gubernatorial campaign, the transition team worked throughout the general election, preparing for what would happen in the event of victory. Carter had made it clear early on that he did not want to mirror the setup and size of Richard Nixon's White House staff; specifically, Carter refused to even name anyone chief of staff, instead changing the title to "assistant to the president." The early planning backfired, however, as a power struggle emerged between campaign staffers and transition coordinators when it came time to choose cabinet members. Perhaps the most apt comparison for Obama's circumstances would be Franklin Delano Roosevelt's ascent to power, as he faced similarly daunting financial challenges at the dawn of the Great Depression. Roosevelt, however, did not benefit from a protracted campaign in which to prepare himself. Instead, FDR found himself forced to pick staffers and cabinet members largely from his extensive network of former colleagues and associates, and did so somewhat haphazardly, under pressure from demanding tasks  such as rescuing the country from utter economic failure. Roosevelt's planning-on-the fly led to the creation of ad hoc "agencies outside the departmental framework" as former Presidential adviser Stephen Hess wrote in his book Organizing the Presidency,  a bureaucratic mess that may have been avoided had Roosevelt's transition process been better planned. See behind the scenes of Obama's campaign.